My children can play with their Moon Dough™ “magical dough” for over an hour at a time and I love how it promotes their creativity and stimulates interactive play. I was delighted to learn that Moon Dough™ has undergone a “make-over” and it now features a better consistency that never dries out. I also appreciate that it is hypoallergenic (wheat free too for those with gluten sensitivity) and is odor free. 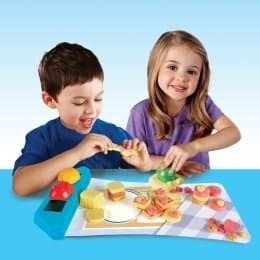 My children were very excited to play with the new Moon Dough™ Push ‘N Pop Ocean Pals play set. This set includes three molds to create an adorable turtle, octopus and sea coral along with 1 play mat, a popper mold holder, 1 twist mold and 2 packages of purple and green Moon Dough™. My kids were squishing, molding and designing their own undersea world and having lots of fun playing together. It was fun to see what they had created in their “magical world”. They really like the “soft” texture of the mold describing it like “cotton candy.” I appreciate that there is no mess that has to be cleaned up and it only takes a minute to put it all away until next time. The Popper Molds are really easy to use and are designed for little hands. Moon Dough™ Push ‘N Pop is also available in a Breakfast set. You can purchase Moon Dough™ at retailers nationwide including Toys R Us, Walmart, Target and Amazon.com. You are also invited to visit the Moon Dough™ website to learn more about this fun toy line for children. Connect with Moon Dough on Facebook and Twitter.